Lavera is a well-known company. Lavera produces organic makeup and other health-related products. They are making many products: lip balms, eye shadows, creams for the body, hands and face, baby cosmetics, men cosmetics and products for hair. And I have already made one Lavera toothpaste review. It was for their Lavera Basis Sensitive toothpaste. Lavera Basis Sensitive did not do good because of few questionable ingredients, but let see if Lavera Neutral with Sea Salt will do better. 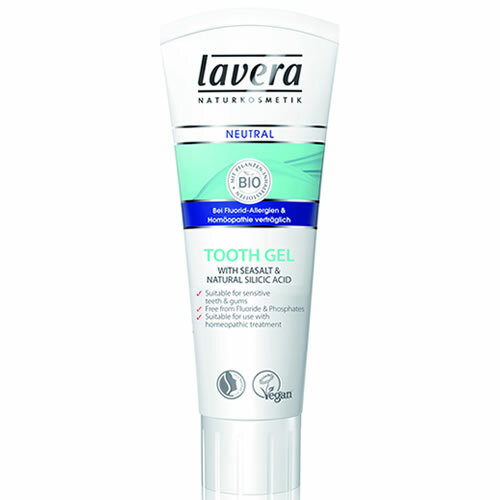 Lavera claims that Lavera Neutral is good for extremely sensitive teeth and gums. I can’t say anything about it because you need to use toothpaste for a longer time to see if it is sensitive. But Lavera Neutral contains mild cleaning agents and sea salt. Lavera toothpaste uses natural carvone oil, a component that is very sensitive to teeth. Lavera Neutral is also Fluoride free toothpaste without phosphates. This toothpaste is also vegan-friendly which means that no harm was done to animals in the process of making this toothpaste. Lavera Neutral have almost same harmful ingredients as Lavera Basis Sensitive. Sorbitol – Used for making the toothpaste tasty. There is nothing natural about this sweetener. Hydrated Silica – Also not organic component. This abrasive ingredient can hurt your enamel. Xylitol – is not harmful to humans but it is to dogs, so if you use this toothpaste make sure your dog is not around. A small amount can kill him. Sodium Cocoyl Glutamate and Disodium Cocoyl Glutamate are ingredients about we don’t know much. We know SLS is derived from coconut, but we can’t say that Sodium Cocoyl Glutamate or Disodium Cocoyl Glutamate is dangerous as Sodium Lauryl Sulfate. Xanthan Gum – It is additive that main purpose is to make Lavera Neutral tasty. It is the artificial sweetener that will make toothpaste sweet. Chlorophyll or Cl 75810 is used for coloring. Chlorophyll is found in almost all plants. But in toothpaste, it is created through a chemical process, and it also has his own number. In cosmetics, it is Cl 75810 and in food is labeled as E141. And we know that the best thing for your body is to avoid all E numbers, except E500 (Sodium Bicarbonate). If you need to choose between Lavera Basis Sensitive and Lavera Neutral I highly suggest that you pick Lavera Neutral. There is a big difference between toothpaste that contains fluoride and those that don’t contain. And Lavera Neutral does not contain fluoride. But I can’t give a much better grade for Lavera Neutral because Lavera uses marketing tricks. They put several artificial sweeteners to bring the taste of their toothpaste. And all this with green color and using Chlorophyll is not needed. I know many people still function on a low level, getting distracted by unimportant things like taste and color. And that is the only reason they put a green color in their toothpaste. Now I m not sure if Chlorophyll is not good for the human body, in fact, research says it is not bad, but putting a not needed E141 in your mouth is really not going to bring your health up.